More than 70 tiger sharks joined this feeding frenzy over a whale as tourists looked on. And the whole thing was captured by a drone. This past weekend, a swarm of more than 70 tiger sharks converged on Australia’s Shark Bay to feast on a massive whale as tourists looked on. And a drone was there to capture the entire bloody scene. 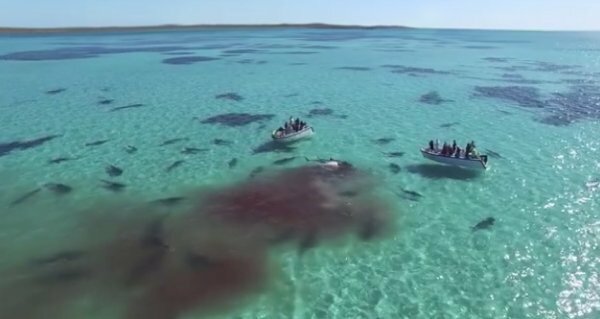 Western Australia’s Eco Abrolhos cruise service came upon the feeding frenzy near Dirk Hartog Island with some of its patrons floating just above the carnage in some small boats. The water soon turns a cloudy red as the hungry sharks tear apart the whale carcass. Shark Bay — a UNESCO World Heritage Site known for its diverse flora and fauna — is home to one of the world’s largest populations of Tiger Sharks. These animals can reach up to 18 feet in length and weigh as much as 3,300 pounds — that’s about as heavy as and slightly longer than the average car — placing them behind only the great white among carnivorous sharks. With teeth that can cut through flesh, bone, and even turtle shells, these aggressive and indiscriminate predators are known to eat everything from jellyfish to sea lions to other sharks (including other tiger sharks) to land animals who’ve gotten too close to the water. And sometimes, it turns out, the list of tiger shark food even includes whales. Learn more with these incredible shark facts and photos. Then, check out the world’s fastest shark and the recently discovered glow-in-the-dark shark.